Then-Ensign George Gay, U.S. Navy Reserve, was the pilot of one of the 15 Douglas TBD-1 Devastators of Torpedo Squadron 8 (VT-8) that took off from USS Hornet (CV 8) the morning of June 4, 1942 for a strike on the Japanese fleet during the Battle of Midway. Another detachment of Torpedo 8, comprised of a few of the new TBF Avenger torpedo-bombers, was flying that day from Midway island itself. Fourteeen TBD-1s of Torpedo Squadron 6 (VT-6) from USS Enterprise (CV 6), and 13 Devastators of Torpedo Squadron 3 (VT 3) from USS Yorktown (CV 5) were the other two Torprons attacking. Around 0915, Torpedo 8 sighted the Japanese carriers and began its attack. Within the hour, Torpedo 6 and Torpedo 3 would also attack. None of the squadrons’ torpedoes scored hits, or if they did, none exploded, a serious problems with the U.S. Navy‘s torpedoes at the time. Only five of Torpedo 6’s 14 Devastators returned to the Enterprise. Only two of VT-3’s 13 TBDs survived the attack. None of Torpedo 8’s 15 Devastators returned, and Gay was the sole survivor of all who took off that morning from Hornet. But three squadrons of American SBD Dauntless dive-bombers from Enterprise and Yorktown – VB-6, VS-6 and VB-3 – arrived before the Japanese fleet could regain formation after evasive maneuvers, spot the decks of the carriers to launch more aircraft, or get its combat air patrol back up to altitude. In a matter of minutes, three of the four Japanese carriers were flaming wreckage. In this U.S. Navy oral history from the holdings of the U.S. Naval History and Heritage Command, Gay remembers the Battle of Midway and his squadron. Lt. George Gay, USNR: Well, as you know Torpedo [Squadron] 8 was organized in Norfolk [Virginia] and I think you know the history of the [aircraft carrier USS] Hornet [CV 8] and where we went and what we did. I won’t go into that but I will say a little bit about Torpedo 8 and the things that they did before the Battle of Midway and before we lost the half of it that was in that battle, stationed aboard ship. Well, Torpedo 8 had a difficult problem; we had old planes and we were new in the organization. We had a dual job of not only training a squadron of boot [inexperienced] ensigns, of which I was one of course, we also had to fight the war at the same time, and when we finally got up to the Battle of Midway it was the first time I had ever carried a torpedo on an aircraft and was the first time I had ever had taken a torpedo off of a ship, had never even seen it done. None of the other ensigns in the squadron had either. One thing we’d like to clear up right to begin with, Lt. [Harold “Swede”] Larson and his half of Torpedo 8 stayed in Norfolk when we left there in order to get TBFs [single-engine “Avenger” torpedo bombers] and get the bugs out of them and get them fixed up for combat, and they were to bring them out and join us aboard ship. However, it happened that we were in the Battle of Midway, he came out on the [aircraft carrier USS] Saratoga [CV 3] and they requested six planes from him to go to the Island of Midway and they participated in the battle that day; however, the bulk of the TBFs attached to Torpedo 8 at that time were in Honolulu [Hawaii] and missed the Battle of Midway. They later went to Guadalcanal and I came home on sick leave. I might just as well start down. Well, Torpedo 8 had a difficult problem; we had old planes and we were new in the organization. We had a dual job of not only training a squadron of boot [inexperienced] ensigns, of which I was one of course, we also had to fight the war at the same time, and when we finally got up to the Battle of Midway it was the first time I had ever carried a torpedo on an aircraft and was the first time I had ever had taken a torpedo off of a ship, had never even seen it done. None of the other ensigns in the squadron had either. Quite a few of us were a little bit skeptical and leery but we’d seen [Lt. Col. James H.] Doolittle and his boys when they hadn’t even seen a carrier before and they took the B-25s off [of USS Hornet during the Tokyo Raid], we figured by golly if they could do it, well we could too. It turned out the TBD [Douglas “Devastator” torpedo bomber] could pick up the weight, so it was easy. We learned everything that we knew about Japanese tactics and our own tactics from [Lt.] Cmdr. [John C.] Waldron and Lt. [Raymond Austin] Moore and Lt. [James C.] Owens as they gave it to us on the blackboards and in talks and lectures. We had school everyday and although we didn’t like it at the time, it turned out that was the only way in the world we could learn the things we had to know, and we exercised on the flight deck, did all kinds of things that we’d have to do artificially because we couldn’t do our flying most of the time. 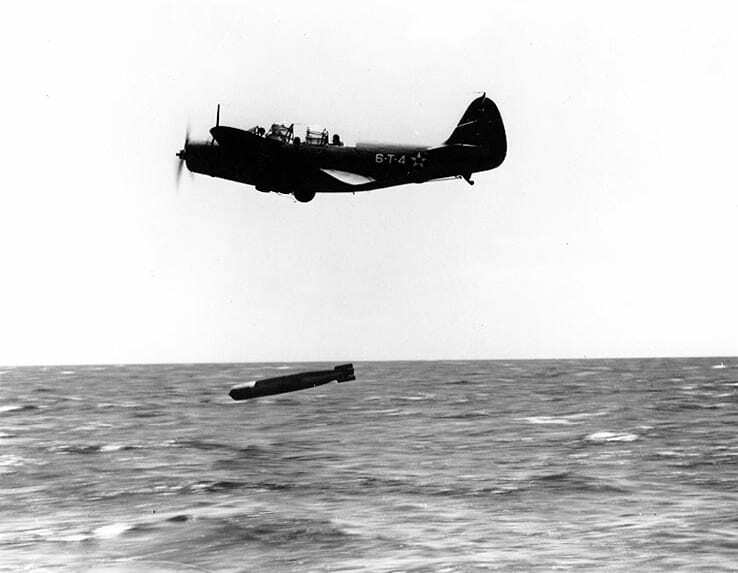 In the Coral Sea Battle we tried to get there and missed out on most of it but we were able along about that time to get in some bombing practice and to do some submarine patrol. However, the squadron didn’t get to fly near as much as we should have. In the actual battle – do you want me to say anything about the actual Battle at Midway and what we had there? As I said, we had had no previous combat flying. We’d never been against the enemy, our only scrap with them had been in taking Doolittle to as close to Tokyo as we went and in trying to get into the Coral Sea Battle, but when we finally got into the air on the morning of June the 4th, we had our tactics down cold and we knew organization and what we should do. We could almost look at the back of Cmdr. Waldron’s head and know what he was thinking, because he had told us so many times over and over just what we should do under all conditions. I didn’t get much sleep the night of June the 3rd. The stories of the battle were coming in – midnight torpedo attack by the PBYs [twin-engine patrol bomber seaplane, known as the Catalina] and all kinds of things, and we were a little bit nervous, kind of, like before a football game. We knew that the Japs were trying to come in and take something away from us and we also knew that we were at a disadvantage because we had old aircraft and could not climb [to the same] altitude with the dive bombers or fighters and we expected to be on our own. We didn’t expect to run into the trouble that we found, of course, but we knew that if we had any trouble we’d probably have to fight our way out of it ourselves. Before we left the ship, Lt. Cmdr. Waldron told us that he thought the Japanese Task Forces would swing together when they found out that our Navy was there and that they would either make a retirement in just far enough so that they could again retrieve their planes that went in on the attack and he did not think that they’d go on into the Island of Midway as most of the squadron commanders, and air group commanders, figured, and he told us when he left not to worry about our navigation but to follow him as he knew where he was going. And it turned out just exactly that way. He went just as straight to the Jap Fleet as if he’d had a string tied to them and we thought that morning, at least I did when I first saw the Japanese carriers, one of them that was afire and another ship that had a fire aboard and I thought that there was a battle in progress and we were late. I was a little bit impatient that we didn’t get right on in there, then, and when it finally turned out that we got close enough in that we could make a contact report and describe what we could see the Zeros [Japanese fighter-bomber planes] jumped on us and it was too late. They turned out against us in full strength and I figured that there was about 35 of them. I understand, that is I found out later, that they operated fighter squadrons in numbers of about 32, and I guess it was one of those 32-plane squadrons that got us. Its been a very general opinion that the anti-aircraft fire shot our boys down and that’s not true. I don’t think that any of our planes were damaged, even touched by anti-aircraft fire. The fighters, the Zeros, shot down every one of them, and by the time we got in to where the anti-aircraft fire began to get hot, the fighters all left us. I was the only one close enough to get any real hot anti-aircraft fire, and I don’t think it even touched me and I went right through it, right over the ship. I DON’T MEAN TO TAKE ANYTHING AWAY FROM THE LIEUTENANT BUT THERE WERE THOUSANDS OF MEN LIKE HIM AND WHAT MOTIVATED THEM IS VERY HARD TO TELL TO TODAYS GENERATION. MAY GOD BLESS ALL OF THOSE HERE AND THOSE NOT HERE. There is not a lot of information on that. Alvin Kernan in notes to his book on Torpron 8 wrote that some in the squadron considered the machete wound to have happened under “questionable” circumstances, but I don’t personally have any more information than that. The Navy and Marine Corps weren’t too happy about the initial news accounts giving most of the credit to the Army Air Forces either, and there were a few dust-ups in bars over that as well.